Gettin’ half killed once’s gotta be better’n bein’ half alive forever. Medicine Walk tells the story of a boy and his estranged father. 16-year-old Frank is an amazing kid; he knows how to do everything. From the time he was old enough to learn, he was taught how to work on the farm and survive in the woods. But his father wasn’t the one who taught him these things. Frank has been living with ‘the old man’ for as long as he can remember; he is the only father Frank knows. They live alone on the farm, and Frank has grown up to appreciate hard work, nature, and quiet. Alone. He’d never known lonely. If he put his head to it at all he couldn’t work a definition to the word. It sat in him undefined and unnecessary like algebra; land and moon and water summing up the only equation that lent scope to his world, and he rode through it fleshed out and comfortable with the feel of the land around him like the refrain of an old hymn. It was what he knew. It was what he needed. As the years of his childhood go by, he comes to learn that the man who drops by from time to time is his ‘real’ father, and he begins to have questions about who he is and where he comes from. The answers to these questions don’t come until he’s 16 and his father, Eldon, has asked him to come and see him for the last time. He wants Frank to take him out into the country to die, and along the way he tells his story to Frank. A story that causes Eldon so much pain that he has chosen to numb it all these years with alcohol rather than tell it. Until now. It’s all we are in the end. Our stories. There are three parts to the story Eldon has to tell. The first is his childhood with his mother after his father was killed in WWII. The second is his own experience in the Korean War with his good friend Jimmy. The third is about Frank’s mother. As a raging alcoholic and neglectful parent, Eldon doesn’t have a lot going for him, but hearing the story of his life, we can’t help but feel his pain while simultaneously shaking our heads at what he has lost and the decisions he has made. How can you not feel for someone who goes through life believing he is the cause for the loss of everyone he loved? Sad’s not a bad thing unless it gets a hold of you and won’t let go. At times, Frank listens patiently to his father, at other times he rails against his father’s choices. He longs to know his mother and his past. But, it’s his connection with the old man that keeps him steady. Unlike Eldon, Frank has a place, and a person, to call home. He raised a hand to the idea of his father and mother and a line of people he had never known, then mounted the horse and rode back through the glimmer to the farm where the old man waited, a deck of cards on the scarred and battered table. It sounds grim, but the writing is so beautiful that it just pulls you along and before you know it the book is done; gut-wrenching but hopeful. One that leaves you feeling very grateful that there are people in the world like the old man. 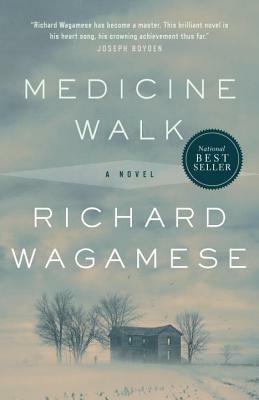 Richard Wagamese is one of Canada’s foremost Native authors and storytellers. To learn more about his other works and his awards and recognition (which are considerable) visit his website. 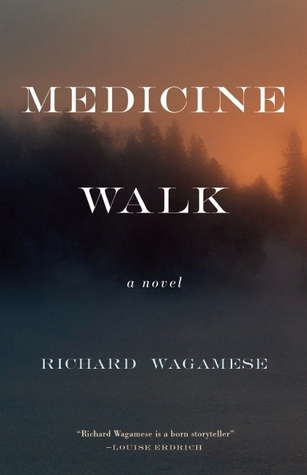 Richard Wagamese discusses Medicine Walk in this interview with Shelagh Rogers on CBC Radio. 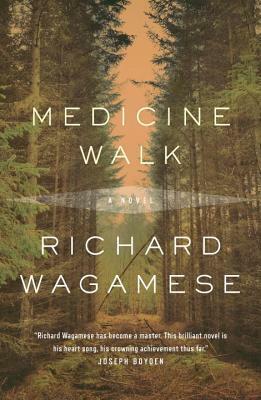 Medicine Walk is my 2nd review for the 20 10 Books of Summer, hosted by Cathy@746Books. This is definitely one for my TBR Naomi, thank you so much for the wonderful review as always. One of my goals more recently has been to discover and read more Native American authors, and as always I am so excited to learn about those writing from Canada from you. We have so many great Indigenous authors here. My tbr is full of them, so hopefully I’ll get to more of them soon! He sounds like a wonderful writer. I also like the links you added, I love author interviews and learning about what makes them tick. Thanks Valorie! I agree – I especially love the story about how the library changed his life. He’s sounds like an amazing person, really. This sounds like a story told with great empathy and compassion, Naomi. It made me want to read the rest of his books. I have a feeling I would like them all! Surely Richard Wagamese is available down there by now. Please tell me he is! This sounds so interesting! At first, I thought this was a nonfiction book and was a little confused, haha – that’s what I get for reading reviews before I drink my morning coffee! Wagamese has also written some nonfiction, but I haven’t read any of it yet. One I would love to read is One Native Life. This sounds really good, Naomi. I’m currently trying not to add anything to my TBR for a week (or more!) just to see if it can be done. 🙂 But I will keep this one in mind for the future! Lovely review. The covers are so pretty, and all are very fitting! I love how thorough you are in your blog with links to CBC interviews and stories and author websites. I had heard those interviews previously and thoroughly enjoyed them. Sometimes writing my reviews can take a while, because I get all caught up in reading about the book and the author. At times, I have to reign myself in and just be content with a few links. Richard Wagamese is one of my favorite authors, and such a profound, humane, and humble soul. I’m really looking forward to reading more of his work! I’m currently in the process of writing a blog post about my plans to read more Native authors this year. Thanks for highlighting Richard Wagamese! Oooh… looking forward to hearing about it! There are so many that are still on my list that I haven’t read yet. I am glad you are highlighting native authors. I was unaware of this novelist. It’s a quiet book. Very somber. The war is only a small part of Eldon’s story, so you don’t have to worry about there being a lot about the war in it. Such an amazing book – i used the same quote in my blog post: “It’s all we are in the end. Our stories”. Richard Wagamese is definitely on my TBR list!! Yes. I’m looking forward to reading more of his books! While I really admired Richard Wagamese’s writing, I really did not like Eldon. Despite all of his hardships, I thought he had plenty of opportunities to turn his life around, but he continued to be selfish, irresponsible and feel sorry for himself. However, I really liked Frank and his relationship with the Old Man. I wish there had been more about their relationship than Eldon and his bad decisions in life. Did you think Frank forgave Eldon at the end of the story? Eldon *was* hard to like. I don’t think I ever really liked him, but at times I felt bad for him. It was frustrating, though, to think of all the times he could have turned himself around but didn’t. I don’t think Frank needed to forgive Eldon – I think Eldon needed to forgive himself. I didn’t get a sense of any real forgiveness – just maybe relief on Eldon’s part to get his story out and acceptance on Frank’s part that this is the way it happened and all he gets to know of his family?